People watch a television broadcasting a news report on North Korea firing a missile that flew over Japan's northern Hokkaido far out into the Pacific Ocean, in Seoul, South Korea, September 15, 2017. SEOUL/TOKYO - North Korea fired a second missile over Japan far out into the Pacific Ocean on Friday, South Korean and Japanese officials said, deepening tension after Pyongyang’s recent test of its sixth and most powerful nuclear bomb. The U.N. Security Council was to meet later in the day to discuss the launch at the request of the United States and Japan, diplomats said. The missile flew over Hokkaido in the north and landed in the Pacific about 2,000 km (1,240 miles) to the east, Japanese Chief Cabinet Secretary Yoshihide Suga told reporters. 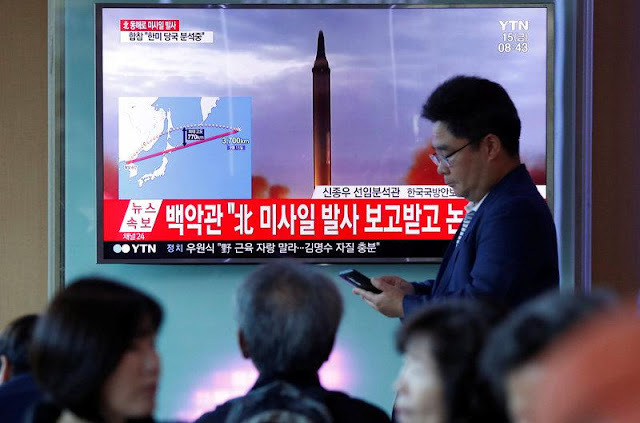 The missile reached an altitude of about 770 km (480 miles) and flew for about 19 minutes over about 3,700 km (2,300 miles), according to South Korea’s military - far enough to reach the U.S. Pacific territory of Guam, which the North has threatened before. On Aug 29, North Korea launched an intermediate-range ballistic missile, the Hwasong-12, which traveled 2,700 km (1,700 miles) over Japan. “The range of this test was significant since North Korea demonstrated that it could reach Guam with this missile,” the Union of Concerned Scientists said in a statement. But it said the accuracy of the missile, still at an early stage of development, was low. U.S. Secretary of Defense Jim Mattis said the launch “put millions of Japanese into duck and cover”, although residents of northern Japan appeared calm and went about their business as normal after the second such launch in less than a month. The U.S. military said soon after the launch it had detected a single intermediate range ballistic missile but the missile did not pose a threat to North America or Guam, which lies 3,400 km (2,110 miles) from North Korea. U.S. officials repeated Washington’s “ironclad” commitments to the defense of its allies. Secretary of State Rex Tillerson called for “new measures” against North Korea and said the “continued provocations only deepen North Korea’s diplomatic and economic isolation”. A poll by Gallup Analytics suggested a majority of Americans appeared ready to support military action against North Korea, at least as a last resort. Some 58 percent said they would favor taking military action if economic and diplomatic efforts failed to achieve U.S. goals. “This is significantly higher than the 47 percent in favor the last time Gallup asked this, in 2003,” the group said. South Korean President Moon Jae-in said dialogue with the North was impossible at this point. He ordered officials to analyze and prepare for possible new North Korean threats, including electromagnetic pulse and biochemical attacks, a spokesman said. Russia said the missile test was part of a series of unacceptable provocations and that the U.N. Security Council was united in believing such launches should not be taking place. The council was to meet at 3 p.m. EDT (1900 GMT), diplomats said, just days after its 15 members unanimously stepped up sanctions against North Korea over its Sept. 3 nuclear test. Those sanctions imposed a ban on North Korea’s textile exports and capped its imports of crude oil. “This rocket has meaning in that North Korea is pushing toward technological completion of its missiles and that North Korea may be feeling some pressure that they need to show the international community something,” said Yang Uk, a senior research fellow at the Korea Defence and Security Forum. South Korea said it had fired a missile test into the sea to coincide with North Korea’s launch and the presidential Blue House has called an urgent National Security Council meeting. Japan also convened a National Security Council meeting. Pyongyang had threatened a day earlier to sink Japan and reduce the United States to “ashes and darkness” for supporting the U.N. Security Council’s latest resolution and sanctions. The U.S. general overseeing America’s nuclear forces said on Thursday he assumed that North Korea’s latest nuclear test was in fact a hydrogen bomb, as Pyongyang had claimed, based on the size of the blast. “China and Russia must indicate their intolerance for these reckless missile launches by taking direct actions of their own,” Tillerson said. China’s foreign ministry spokeswoman, Hua Chunying, denied that China held the key to easing tension on the peninsula and said that duty lay with the parties directly involved. “Any attempt to wash their hands of the issue is irresponsible and unhelpful for its resolution,” she said, reiterating China’s position that sanctions are only effective if paired with talks. North Korea fired a second missile over Japan far out into the Pacific Ocean on Friday, South Korean and Japanese officials said, deepening tension after Pyongyang’s recent test of its sixth and most powerful nuclear bomb.